The above bowl of decadent gastronomic pleasures gives a whole new meaning to the IN-TER-NET. I know I could make this at home, but eating it at a local "Internet" shop, amongst the chain smoking, young, hip and happening locals, IS the real essence of this experience (It's a place to see & to be seen, Wiwid at Fatmawati). 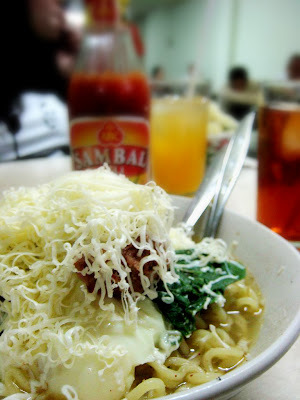 As a part of my growing sense of nationalism, I always crave anything Indonesian. Every time I visit my home country, I went all Indonesian-Crazy, I just wanna eat Indonesian food, Indonesian snack, Indonesian dessert, drink Indonesian drinks, wear Indonesian traditional clothes, just Indonesian EVERYTHING. Thus, for coffee, I wouldn't even as much as glance at Starbucks or Coffee Bean & Tea Leaf, I'd prefer something local. There are many lovely local cafes in Jakarta, and my sis, the true "drunk this-eaten that" Jakartanian, brought me to this delightful shop, Bakoel Koffie. I love the athmosphere, accented by local touches here & there. The huge blackboard behind me was full of coffee-related quotes from everywhere. My favorite one was "Chocolate, men, coffee, some things are better rich - anonymous". Bakoel Koffie serves International selection of coffee as well as Indonesian ones. My sis and I ordered Indonesian Iced Coffee, Oreo cheesecake (too bad no Indonesian dessert available at that time), and kopi tubruk. Waroeng Podjok, miss you much!